Hi and thank you for joining me today. I often wonder how people find their way to my blog. Is it after seeing my youtube tutorial, Pinterest, Facebook, email? It would be good to know. Anyway today's project is some gift tags. We were set a challenge in the Pootles team to make a tag that was 2 1/2" x 2 1/2", this I not the usual size I do for a tag as I normally make them rectangular. However I feel it is good to step out of your comfort zone sometimes and try something new. This week there is also a DT challenge on the facebook group Stampin Fall All to make a Tone on Tone project, so always wanting to save time I combined both challenges. So these tags are all Whisper White. 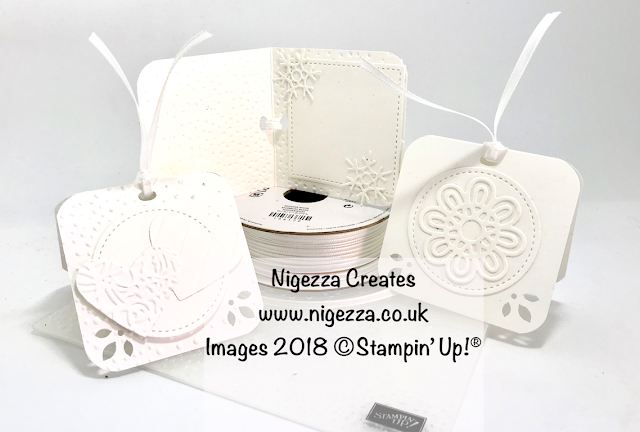 I made an any occasion one with a flower die, a Christmas tag and a Wedding tag. Each tag measures 6" x 3"
Scored on long side @ 3"